Canada has been a land of immigrants since the first European colonizers of the 16th century. There have been numerous successive waves since then. Up until the second half of the 20th century the majority of immigrants have been from Europe. More recently, the demography has shifted to visible minorities, the greatest representatives of which are from South Asia and China. The primary law governing immigration in Canada is the Immigration and Refugee Protection Act from 2002. The admission classes of immigrants are: the family class, which allows citizens or permanent residents to sponsor family members for admission into Canada; the economic class, which provides entrance to applicants and their family member who are likely to contribute to the Canadian economy; and the refugee class, which provides admission to refugees and others requiring humanitarian protection. At 156,000 new immigrants in 2016, the economic class of immigrants is by far the most accepted class. Nearly three times as many economic migrants were admitted as the next class, the sponsored family class. Immigrants to Canada tend to be well educated. Roughly sixty percent of landed immigrants in 2017 had a university degree or postsecondary certification. Despite this, unemployment among immigrants has been on average 0.5 percent higher than that of natural-born Canadian citizens over the last decade. However, the longer immigrants have lived in Canada the more likely they are to be employed. In 2017, the unemployment rate for immigrants landed in Canada more than a decade ago was about 1 percent higher than of those immigrants landed within the previous five years. 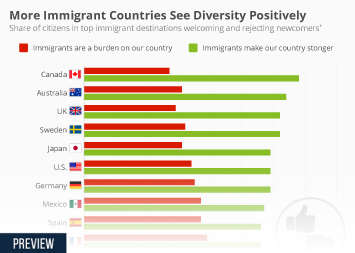 Canadians have a largely positive view of immigrants with 56 percent of respondents to a 2014 poll saying they either agreed or strongly agreed that Canada was better off because of its multiculturalism, and 55 percent saying they thought immigrants were import for the future stability of Canada’s economy.